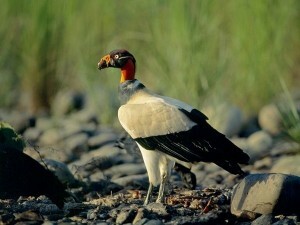 King Vultures have been known in early American civilizations in a variety of manners. Mayas included them in their hieroglyphic writing system with their symbol meaning ‘king’. Rural South Americans thought that if their shadows touched you a misfortune would occur, and Native Americans used their blood and feathers to ward off disease. Also called the American King Vulture, this bird of prey spends much of its time soaring high above the ground in search of carrion. They hunt for their dead and dying food by scent. Vultures have a better sense of smell than most other birds due to their large olfactory (scent) glands, but the King Vulture is lacking these. 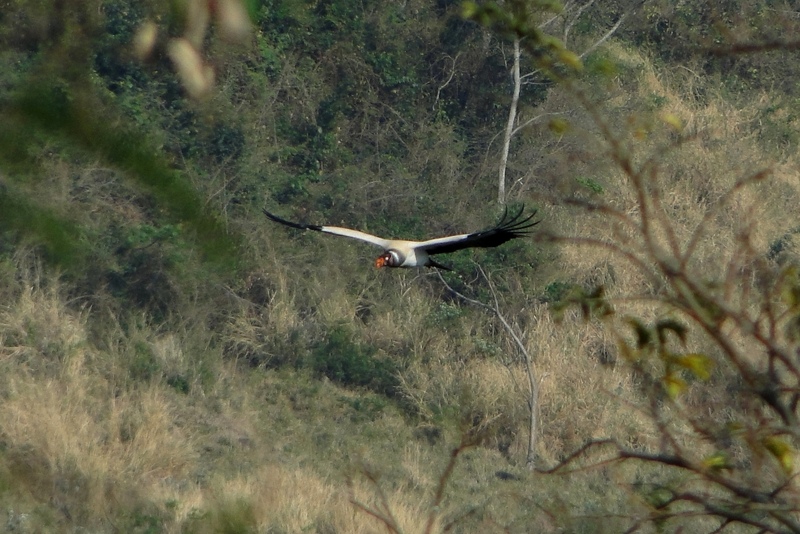 This sense of smell aids the smaller vultures in finding their prey in heavily forested areas. It leads larger Vultures, like the American King, to the prey that the smaller are circling. This Vulture actually makes it easier for smaller vultures to eat, since its beak is better suited to ripping tough hide and skin. These raptors rarely flap their wings, yet spend their hours in flight going from thermal to thermal. They live approximately 30 years in captivity. 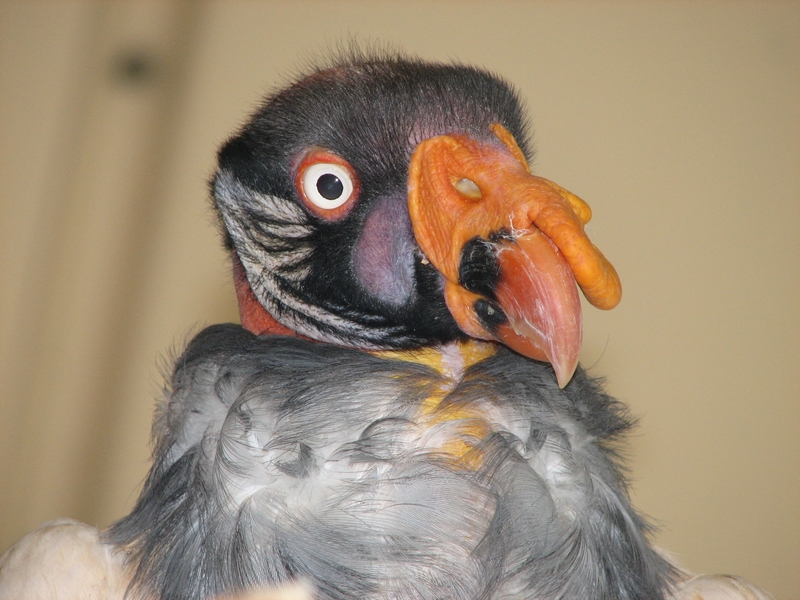 Without a doubt, the King Vulture is the most colorful bird in the vulture group. Its basic color is creamy, with its wings and tail being black, and its legs and feet gray. It has no feathers on its head or face to keep the blood of their prey from getting in them, but its skin is a yellowy rose and orange, with black and gray markings. Its wattle is bright orange and red. Its eyes are a pale yellowy color. 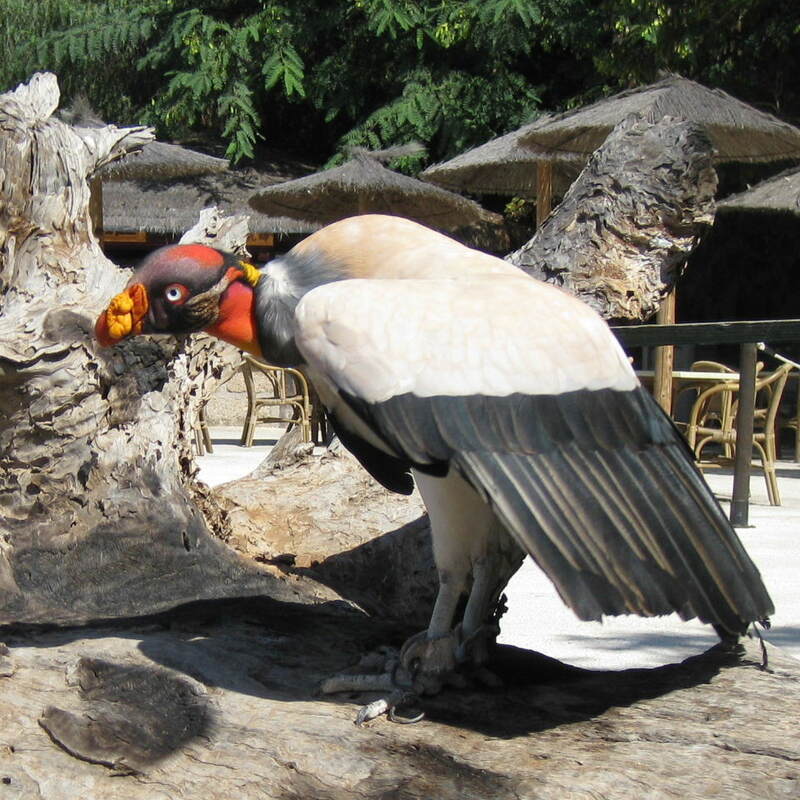 The short blunt claws of the King Vulture are used in perching or walking, not in seizing prey, as in other raptors. Their tongues are rough like a cat’s and are used in pulling meat off bones. One of the largest vultures, its wingspan measures four feet and it stands 30 inches tall. 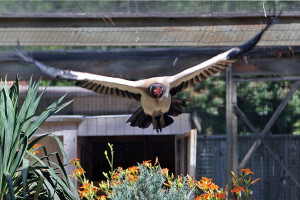 The King Vulture is rarely kept in captivity, and is generally only seen in zoos or in captive breeding programs. This should not be a surprise since this species is both endangered and difficult to keep. 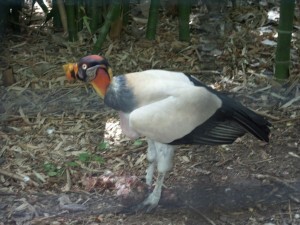 It has been reported that the King vulture is particularly sensitive to frostbite, and precautions should be taken to prevent exposure to cold for this reason. The King Vulture is particularly sensitive to frostbite on its toes, if any toes are lost due to frostbite there is a high probability that this glorious raptor will have to be euthanised. 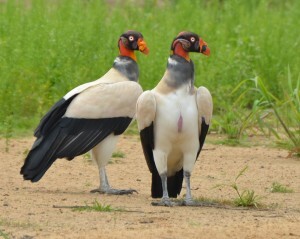 Male and female King Vultures are identical and can only be sexed via DNA analysis or surgery. These raptors become sexually mature between the ages of four and five years. They prefer nests on the ground, such as niches under rocky overhangs, fallen logs, and stumps. They do not usually build a nest, but use what is already there with little rearrangement. One or two eggs are laid at a time, and both parents share the incubation of them. The eggs hatch between four and six weeks after they are laid, and the chicks are a brown color. The chick will leave the nest after about a year and will get its adult plumage at around 18 months.